Although it was not the first GMT-Master that Rolex produced, many consider the reference 1675 to be the quintessential vintage GMT, as it marks the introduction of crown guards, and has a production period that includes both gilt and matte dial variations. 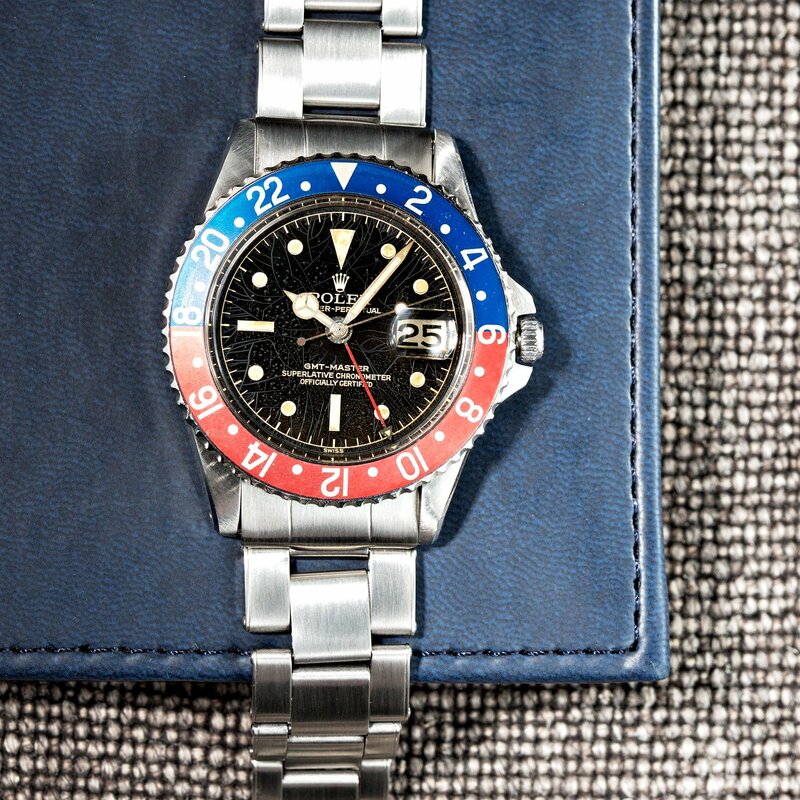 This 1675 GMT-Master is so special for its history. First introduced in 1959, the reference 1675 stayed in production for over two decades until it was discontinued in 1980. 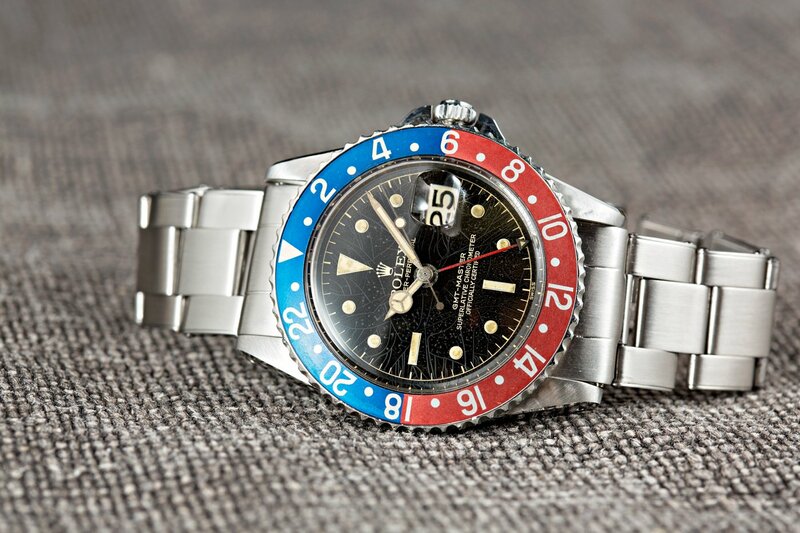 Due to its extremely long production run, Rolex manufactured the reference 1675 with a wide variety of dial, case, bezel, and hand variations; and certain early or rare iterations have become quite desirable among collectors. A 1675 GMT-Master with an amazing history. Robust build quality and a long production period have resulted in a fair number of 1675s still in existence today. Additionally, as the GMT-Master line was originally intended for transcontinental pilots, some surviving examples have acquired unique and fascinating histories, as they passed from one generation to the next, circumnavigating the globe. 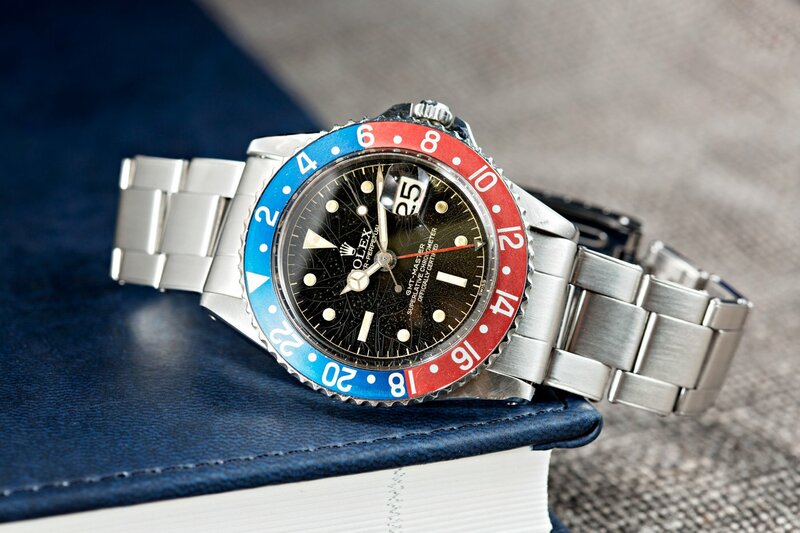 In August of 1962, while on R&R from the Vietnam War, LTC James E. Gray, Jr. purchased a reference 1675 GMT-Master from the Geneva Watch Company in Kowloon, Hong Kong. The purchase came at the recommendation of a superior officer who had told James E. that the Rolex would make a nice keepsake, and directed him to the location of the watch store. The price of a Rolex watch will always increase, so buying today is always better than tomorrow. The GMT-Master that James E. purchased was an early example of the reference 1675, with a gilt dial, pointed crown guards, and a small GMT hand. Not wanting his wife to know about his extravagant purchase (he paid roughly $125 for it at the time), James E. chose to wear the watch rather than send it back home for safekeeping. Less than four weeks after purchasing his Rolex, James E. was shot down and wounded. This earned him his 3rd Purple Heart (he had previous war accommodations from WWII and the Korean War). After being wounded, James E. was sent home – only to return to Vietnam after he had recovered. Amazingly, the watch box and all documents were still in his footlocker, which ultimately made it back to his family in the United States. While serving James earned his 3rd Purple Heart when he was shot down. James E. Gray passed the reference 1675 to his son, LTC James S. Gray in the fall of 1980, when James S. completed his Black Hawk flight training and earned the status of a Black Hawk test pilot. After receiving the watch, LTC James S. Gray went on to wear it daily, while on duty in Africa, the Middle East, and inside the Arctic Circle. In June of 1999, the reference 1675 was passed on again, this time as an engagement gift to James M. Gray. James M. wore the watch every day for roughly a decade, before deciding to place it inside a safe. In September of 2016, James M. Gray passed away, leaving the watch to the youngest, David R. Gray. Note the dial of this incredible watch. Upon the passing of James M. Gray, David, James S., and James E. collectively decided to allow the watch to be passed to someone new. The watch had faithfully served the men of Gray family – through times of war and peace – for several generations, and the past owners of the watch felt that it was time for their reference 1675 to continue with its journey. 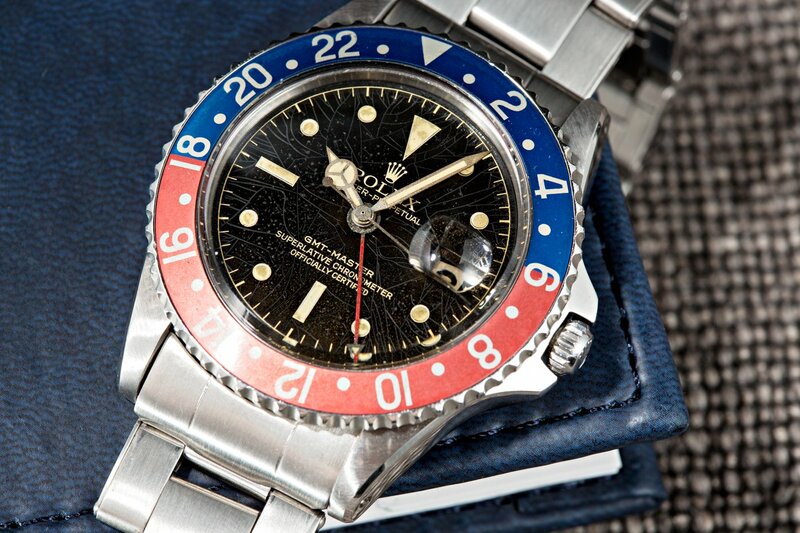 While contemporary Rolex boast all of the manufacturer’s latest and greatest technologies, it is vintage Rolex where one will find the greatest variations between different iterations of the same reference. 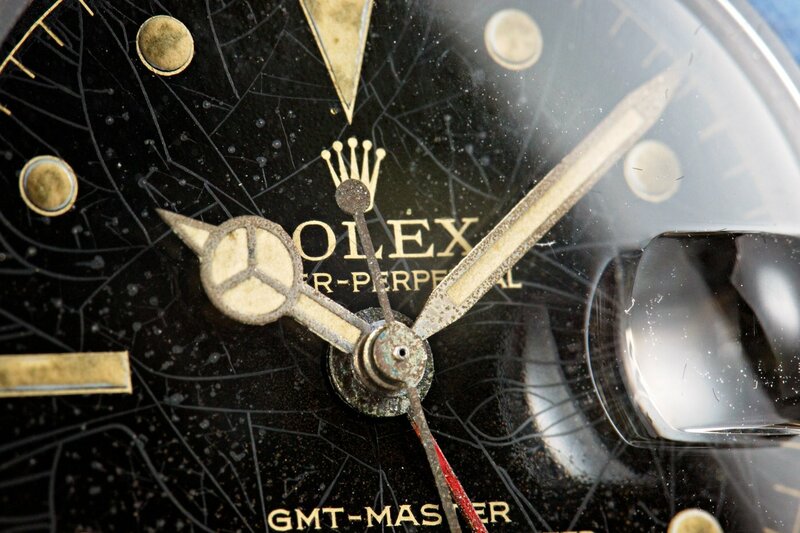 A brand new Rolex is an astonishing exercise in precision and consistency; however vintage watches possess the wear marks, history, and overall character that can only be earned through time and use.